The Wyred4sound mINT integrated amplifier is a Goliath in David’s clothes! The word is permeating profusely so all you ‘hi-fi ‘die-hards’ should take note: Class D power amplification is here to stay, and there will definitely be a surge of expanded usage in the very near future. Although some audiophiles may proclaim, “they will never Beat a Class A or A/B amplifier”, with the Wyred4Sound mINT, who knows – they may soon have to eat those words! TO ‘D’ OR NOT TO ‘D’ ? In many applications, the inherent advantages of Class D can be truly overwhelming. Often erroneously referred to as “digital amplification”, Class D amplifiers represent the zenith of amplifier efficiency, with rates in excess of 90% being achieved in the real world. Some Audiophiles speculate about the overall superiority of the reproduced sound quality emanating from class AB amps (not to mention class A) as compared to digital amplifiers, claiming the former have a more ‘effortless’, fluid sound quality as compared to Class D designs. Having heard many of the best Class A/AB amplifiers over the years, I would not take much of this ‘poppycock’ to heart. Judging each design on its own merits is undoubtedly the smart approach. However, the hi-end audiophile 2-channel stereo amplifier market might still prove it a difficult point-of-entry, as (performance??) and perception still override such issues as size, weight, power consumption, and cost. In fact, you could probably count on one hand the number of full frequency range “high definition” audio amplification manufacturers currently using this technology; e.g. Peachtree Audio, the newest Marantz integrated and power amps as well as Bel Canto which has used Hypex modules as the heart of their Class D designs. Located in Atascadero CA., The Wyred4Sound company started out business in late 2007 and is currently stirring up a huge amount of excitement among music lovers and audiophiles. Let’s find out why! Currently, the ICE power modules are the leading parts/amplifier company which enables audio manufacturers such as Wyred4Sound to bring innovative, high-quality and startlingly accurate sounding class D amplifiers with switch mode power supplies to the market fast and cost-effectively . This happens to be the first-Class D amplifier that I have personally used and examined. It’s proprietor and designer, Mr. E.J Sarmento has come up with a line of amplifiers, DAC’s and music servers that when approached with regard to their respective price points, appear to represent magnificent values for the true “high end” audiophile. Although the mINT is a small, (approximately 12″ by 10″) it is an abundantly sturdy and good-looking unit with a silver face plate surrounded by black anodized panels. 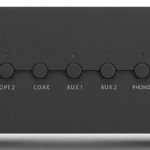 Its front panel has beautifully laid out buttons for its various inputs; USB, Coax, Toslink Optical and 2 Auxiliary selectors. The supplied Coaxial and Toslink inputs will support 24-bit/192 khz resolution files while the USB interface can handle 24 bit/96 Khz high resolution files. I made good use of the digital coax and USB inputs to test out its internal DAC, and the ultimate results were hugely impressive! On its back panel, below its digital inputs, there is a pair of analog audio inputs (Aux 1 and 2) that are bordered by two other sets of RCA inputs, Aux Out (preamp out) and Fixed Out. Out of curiosity, I decided to laboriously drag out my almost 40-year-old vintage Spendor BC3, loudspeakers (known to have a pretty horrendous impedance curve as many of the finest amps sound quite unhappy trying to drive it). To my surprise, the Mint made this speaker ‘sing’ like I had not heard in many years! The mINT’s internal DAC is powered by an ESS DAC chip, which is similar to the company’s individual DAC although E.J Sarmento acknowledges a somewhat superior performance in his separate DAC’s. We’ll touch on this aspect of the amplifier later on in this expose. The internal DAC can support files up to 24-bit 192kHz via its coaxial and/or optical inputs, whereas the USB input is capable of supporting files up to 24-bit 96kHz. Leaning towards the more ‘traditional’ or unorthodox way of evaluating audio components, I have always found that classical, choral and/or acoustically well recorded, minimally miked, pop or jazz to be the most discerning and convincing way to analyze the sound quality of most, if not all, high definition audio components. As such, this review of the mINT involved mostly classical, choral, pop and film music program sources – some of which were recorded in 24-bit/192kHz formats. Others involved live concert programs recorded and streamed in non-compressed WAV and FLAC files which I transferred to CD-r Disc. A few of these files I have personally remastered to the aforementioned formats. I also connected a “Black Magic” USB cable, listed below, directly to a MAC notebook (yech…I’m a PC user) and found the above files played quite brilliantly through this connection. Although the jury is still out, I have personally found uncompressed WAV files to sound somewhat better than FLAC; supporting up to 32 bit and Float (if desired) although this has NOT always been the case! While there is no hard data (that I am aware of) to prove to the engineers among you that a so called “break-in” period exists, most if not all astute audiophiles have heard the benefits of the process and believe strongly in its importance. In this case, the mINT amplifier was no different. Initially, the mINT was performing quite nicely as I enthusiastically played through a number of my CD’s and WAV files – the inauguration began with in my (and the composers opinion), the definitive re-recording of Elmer Bernstein’s “Magnificent Seven“. Immediately, The miNT literally exploded, offering a huge soundstage and a field of depth that went deep beyond the back walls of my listening room and beyond the barriers of the loudspeakers themselves. The imaging localization of brass, winds and tympani was quite specific and as we shall see, it only got better with further use. My foremost initial impressions, say 20 hours or so, suggested a most important quality that should be displayed by any cultivated amplifier design (assuming of course that your loudspeakers are up to the task) and that was violin string tone. This little amplifier displayed the sounds of massed strings with a beautiful degree of rich, resinous, decadent silky textures with a natural touch of bite on violin transients. As most of us can still acknowledge that the reproduction of mid and high frequencies are at the heart of any well-made audio component, (most particularly loudspeakers), the mINT was able to reproduce the sound of strings with a sense of air and seductiveness that was truly thrilling; particularly when using some of the best recorded program material. Assuming that most individuals rooms are decently balanced and treated acoustically, the ambience and decay of the mINTS string sound from ‘particular’ recording venues was something that was marvelously exploited as to its ‘concert hall’ realism–quite a feat indeed particularly at its price point! While the full reproduction of a grand piano can in many instances be hard to reproduce with particular recordings and audio systems, the mINT became quite an exceptional and wonderfully satisfying performer within this regard. 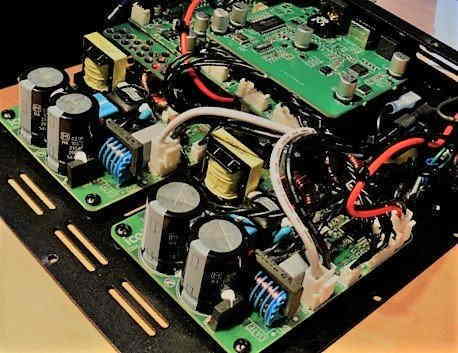 For the pop, rock devotees, you’ll no doubt be wondering about this amplifier’s bass response. Let’s just say that generally speaking, the way the mINT handled the lower registers of the Steinway piano as well as double bass and cello reproduction in my listening room should put any of your doubts to rest. Additionally, bass guitars were firm, deep and as well defined as your particular loudspeakers usable low frequency response will handle. More importantly, this amplifier brought forth some well appreciated and distinct purity to the natural tone of reproduced musical instruments, particularly the glorious lower registers of the cello. As such, it was able to differentiate much if not all of an orchestras individual and combined sound as it reached deep and far back from the encompassing loudspeakers borders. The mINT quite aptly defined these musical IMAGES, with exceptional accuracy and image localization within my good sized 23 x14 listening room. Soundstage width was no less impressive. When used with the Quads and Spendors, the already complete openness of the sound field was faultless, while at the same time it never reduced that superb image specificity that are inherent hallmarks of these loudspeakers’ designs. (Please see this superlative performance and recording of Mozart’s C minor mass as an example of an older, minimal microphone technique specimen from EMI. Another profoundly recorded dvd audio track of the same piece will also invariably show off the mINT ‘s midrange and treble accuracy and most particularly, adamantly define your systems inherent (or lack thereof ) stereo imaging properties. I also managed to pull up a well delineated remaster of my favorite and arguably, one of Sinatra’s best recordings of all time, “Where Are You” with Gordon Jenkins conducting. As it was his last Capitol Records venture before moving to Reprise, you will be utterly surprised at how well Sinatra’s voice was captured in this 1958 release. His renowned vocal intonations were decidedly articulated along with a fine, focused center image and orchestral depth that was discreet and evenly distanced . Not surprisingly, my mind constantly kept urging me to “keep this mINT playing a bit longer!! As is obvious from above, this amplifier showed itself to be amazingly accurate, smooth, and well ‘truthful’ from the lowest registers and up through the sometimes all to ‘tricky’ area of the treble range with not even a trace of mid/treble coloration. Ultimately it became a trademark of the mINT’s neutrality as combined with any lack of treble ‘brightness’ on or above say, 8-10 Khz. Just be aware: The mINT will display the purity of what it is fed; nothing more and nothing less! As such, the amplifiers innate and enviable qualities bring forth an easy to listen to sound that is never strained, but when called upon for orchestral or vocal climaxes, its power reserves were eager and ready for work; sounding powerful and authoritative. It flaunted musical transients with total control and finesse. The beauty of any great hi-fi component culminates when you sit down and get the feeling of a ‘live ‘concert hall setting in your preferred listening room. The baby mINT amplifier has captured this in spades bringing the most accomplished loudspeaker designs inherent qualities to their full fruition. Towards the end of my time with the mINT, it was all to apparent that the designer had taken an exceptionally wise approach when applying his technical expertise into this unit– virtually insuring a non-existent amount of problematic interactions between the source components and loudspeakers. I was quite curious, however, to get a good grip on the sound quality of mINTS internal DAC. Consequently, I proceeded to connect the digital output from the Marantz SA-10 with both the Mad Scientists USB ‘Black Magic’ digital interconnect as well as the 75 ohm Audio Arts Digital coaxial connectors (review coming) going into the MINTS digital inputs. It would not be to shocking to state that the reference quality of the Marantz DAC was and is quite breathtaking in its beauty and sonic seniority. I also put the sublime Chord Qutest into the mix to analyze any sonic perceptual differences. However, the mINT ‘s DAC was not to be humiliated quite that easily. Differences did exist – however tiny with regard to a minuscule loss of soundstage width and ultimate clarity as opposed to its otherwise all-inclusive full sonic picture. This hardly disbanded the quality or pleasure the DAC in the mINT exhibited by a long shot. Remember: we have here a superb DAC encompassed within an amplifier that arguably, exhibits ‘state of the art’ qualities for $1,000 as compared to the $7,000 Marantz CDP! With a modern and sprightly outward look and feel, Wyred4Sound’s mINT amplifier turned out to be a wondrous performer which most certainly fulfills its promises in terms of its design, beautifully accurate sound quality and its foolproof precision build. Powerful, easy to set up and work with as well as being ergonomically delightful, there is not much more an audio enthusiast could ask for in an integrated amplifier. Paradoxically, in the world of today’s audiophile “groupthink”, the mINT ‘s inordinately and comparatively great price could mean that in terms of sound quality and its size, it may ultimately leave something to be desired. However, don’t be fooled! There is much more going on here psychologically than one might imagine. In my humble opinion, the real differences between the best amplifiers is how they translate music into sound. This emotional connection to the music may indeed appear to be stronger in amplifier designs which cost extraordinarily huge amounts of money. However, in the “real world” with long, astute, down to earth listening evaluations, this (seldom) is the case! Some people, (meaning audiophiles) find the idea that being able to afford such a high performing amplifier should cost ‘high end’ money as well as taking up more space on their audio rack. This, unfortunately, can result in the all too often seen form of audiophile ‘elitism’! Let’s stop the nonsense! Excellent performance will speak for itself – just let your ears be the judge. 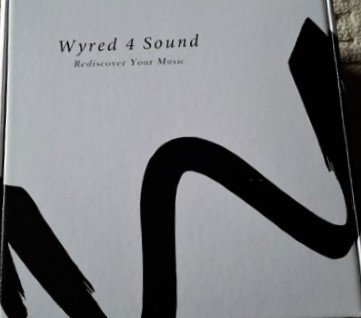 In this case, Wyred4Sound’s mINT takes the full prize! 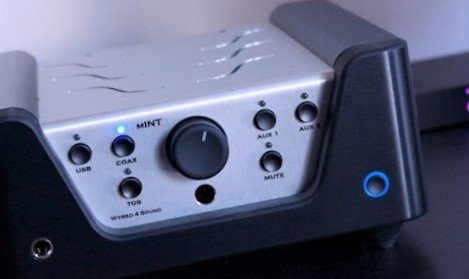 As such, The mINT has taken the Class D amplifier to its ultimate boundaries- to a point where this reviewer will be constantly on the lookout for new products from Wyred4Sound, as I believe that the technology applied here is most undoubtedly of ‘reference quality”. It can, in almost every way, sonically stand up to any of the finest Class AB amplifier designs (dare I mention Class A?) currently on the market. Wyred4Sound’s mINT is a superb amplifier that in practically all ways, reaches ‘state of the art’ performance parameters and is intensely recommended! This company is HOT! CHORD'S 'ETUDE' amplifier and SPENDOR A7 LOUDSPEAKERS NOW AVAILABLE!